The prolonged dry spell meant watering again took place to prevent extremely firm ground. An enormous amount of effort had gone in to produce far better ground in my view than for the March fixture at this venue. I would describe the going as Good, Good To Firm in Places, with the slightly firmer bits being between the three mile start and the first bend. The Hunt Members is restricted to maidens and seven horses faced the starter. Cherryland was streets ahead of the other half dozen on all known form and the odds-on shot duly obliged under a motionless Colm McCormack. Colm has gone into many notebooks this season as a rider with much potential, but he didn’t have to get lower in the saddle at any stage this time. Cherryland absolutely hacked up and the 15 length winning margin could easily have been even more emphatic. 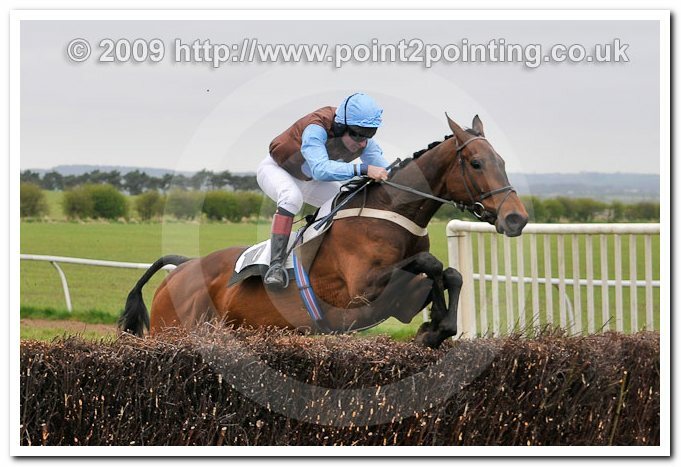 His previous two efforts had been at Charm Park when he ended up a decent third on both occasions. Cherryland will obviously find things more difficult in restricteds than against these modest types, but he does have some improvement left in him. Runner-up Northern Rambler ran considerably better with headgear on for Katy Bannon than he had for a long time. Although readily left behind from the top of the hill, Northern Rambler was miles clear of the remainder. The tailed off third, Opus Star (Tina Jackson), did pass some weary opponents on the last lap, but she basically never figured. The Real Rocker in fourth remained in touch until the final half mile, but rapidly lost ground from then on. The 2m4f Maiden saw 13 horses go to post and Forge Valley benefited from the drop back in trip to keep on well in the closing stages to score in the hands of Guy Brewer. 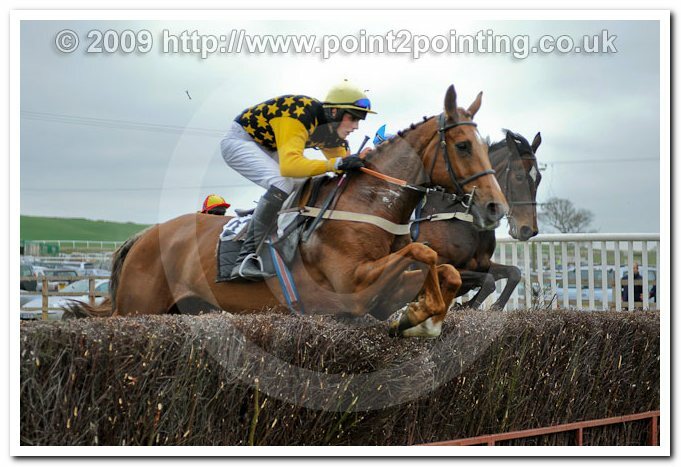 Forge Valley pinched this contest when he was kicked on after four out and he made the best of his way home from there. John Dawson’s mount Lewesdon Duchess took second, but had no answer to Forge Valley’s late surge. Lewesdon Duchess also appreciated the lesser distance, as she had at Tranwell on her last outing. 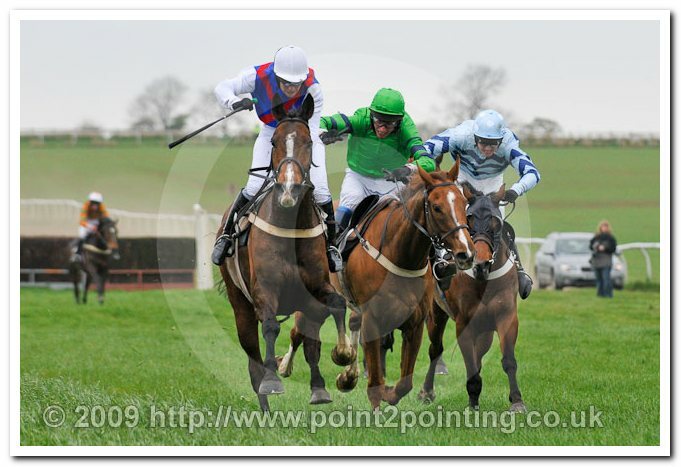 That day, she had chased home Craiglands at a respectful distance and that one has gone on to land a Sedgefield hunter chase. A seven-year-old, Lewesdon Duchess’s best chance of picking up a race will be a short maiden in 2009. Tom Greenall guided Special Portrait into third. Patiently ridden, Special Portrait made progress on the final circuit, but could make no impression on the winner from the penultimate obstacle. Fourth-placed Lady Delilah made a step in the right direction as she got round for the first time in points. Pingpong was a bit disappointing. The four-year-old Bunty Beat jumped well, but quickly got tired after a mile and a half. There were just six runners for the 3m5f Mixed Open, but it produced a great finish with a trio jumping the final fence as one. Oaklands Luis got up a great head of steam coming down the hill and Tina Jackson galvanised him into a late burst that saw him get his head in front in the shadow of the post. This was a game display and the gelding gained due reward for his endeavours. Oaklands Luis isn’t the greatest in terms of consistency, but on his day is a match for most. Runner-up Forty Shakes was just run out of it approaching the line despite plenty of assistance from Chris Dawson in the saddle. 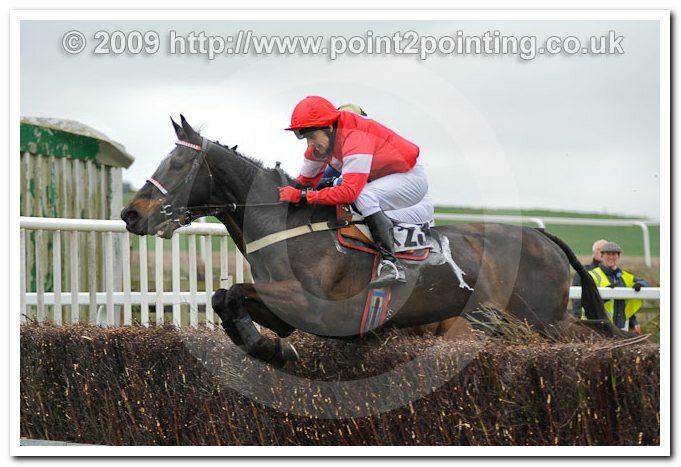 He is slowly regaining his form after a spell in the doldrums and is nearing where he was when collecting hunter chases at Catterick and Sedgefield in 2007. Lou Du Moulin Mas (Tom Greenall) in third gave best on the run-in, but it was still a significant improvement on his past achievements between the flags. Maybe he is finding things happening too quickly nowadays in normal races. In fourth, Wilfie Wild found the extra distance beyond him as he was travelling with purpose after three miles, but his stamina seemed to give out thereafter. He will be thereabouts back over the conventional trip. Snizort wasn’t on a going day. Ten horses came under orders for the Restricted and it looked pretty competitive on paper. 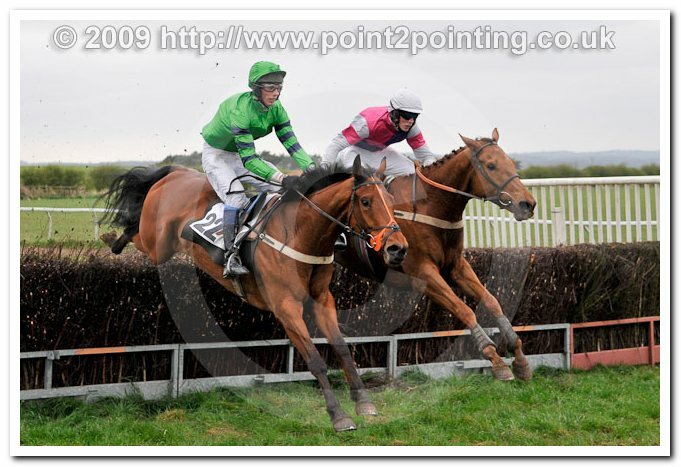 Despite ploughing through the last, The Viking had sufficient speed on the flat to gain top spot under John Dawson. Occasionally frustrating, The Viking hasn’t been the simplest to keep healthy, however there’s no denying he has a fair amount of ability. The Viking was far from disgraced behind the subsequently prolific Eliza Doalott at Duncombe Park in February. Its Teescomponents stayed on for Colm McCormack to be second. The winner was always doing enough and she couldn’t quite get there. There was a lot to like about the way she knuckled down to the task in hand and it shouldn’t be long before she goes one better. She’d taken her maiden at this course three weeks ago. Goforthegap kept on at the one pace in third for Tom Greenall. He isn’t one of the stable stars, but a lesser event can come his way. Nectar De Guye filled fourth and, unlike when he claimed his maiden at Dalton Park in March, had company at the head of affairs. He deserves some credit for this though as he didn’t give up when those ahead of him went past. There was a steady initial attempt in this grade by Saddlers Singer. The Confined had a field of 11 and Ballybrakes was sent off the short price favourite. However, he ran out at the 3rd fence, leaving Miles Seston hobbling away. That allowed the door to open for Queenies Girl and Paul Frank to claim the spoils. Queenies Girl exhibited a stoic attitude to fend off all comers in the rush to the judge. Hutton Rudby, Mordon and Easingwold seem to bring the best out of her and she could well add to her tally either here or at the last-named track before the season is out. Runner-up Brown’s Beck stayed on under Steve Charlton, but was unable to get back up. Brown’s Beck goes well fresh so it was no surprise to see him primed and ready for this reappearance. 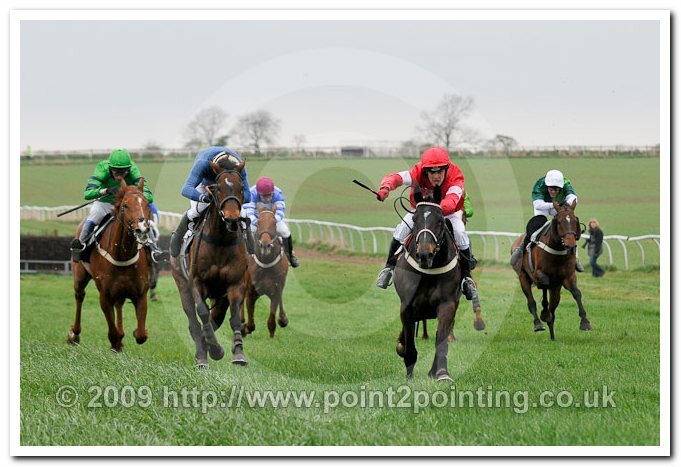 Although he prefers top of the ground, it was late in the calendar for him to kick off 2009. He should continue to make his presence felt as when this fellow is in opposition, any runner knows they have been in a race. Sir Alf, a standing dish at his home course where he has managed eight victories bagged third, with Chris Dawson in the plate. Beaten three lengths, Sir Alf lost little in defeat. High Moor was back in fourth and likes it round here. 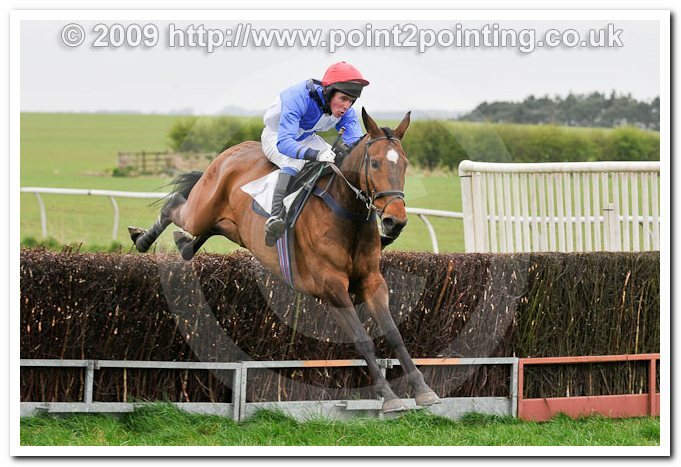 Moss Bawn dropped out once headed, while Quinta De Lobo couldn’t go with the principals in the latter stages. There were nine runners for the 3m Maiden, which saw Racing Ace, heavily supported in the ring, and Chris Dawson come out strongest in a tussle with Pop Play Again, partnered by Chris’s brother John Dawson. He took a little time to get into gear, but once Racing Ace was asked to win his race, he did so nicely enough. Given time to get over a Brocklesby Park fall whilst leading, Racing Ace showed great resilience to ward off the runner-up. Pop Play Again had only found Its Teescomponents too good on his seasonal return and this was another solid effort. He should lose his maiden tag before long. Toby Greenall guided Napalm into third. Napalm has had his limitations exposed previously so it probably says a lot about the lack of quality away from the top two that he was next. Devils And Dust was well behind in fourth.